A 1974 Graduate (BS Education) of Niagara University, Moore’s career has seen him serve in various executive leadership capacities for over 30 years. His focus was largely on several gender related wellness and health initiatives within the YMCA, Roswell Park Cancer Institute, and the nursing profession respectively. For over a decade Moore directed the philanthropic development program for the State University of New York at Buffalo, School of Nursing. During this time, he conducted literally thousands of interviews with nurses and health practitioners, patients and surviving family members in some 40 states over a 15 year period. The advice and counsel he obtained from these interviews are an important source of his work, as he plays back the collective voice of nurses and holistic healing practitioners in so many disciplines and venues. Blending their knowledge and experience about human healing with his own experiential insight and inspiration, Moore returns this energy with encouragement to all healers with the valor to do such blessed work. In essence, he extends appreciation, while encouraging all of us to support the healers of our world, and to examine these lessons of self-healing for ourselves. Moore’s heartfelt words expressed in his stories and poetry convey the impact nurses and other healing and wellness professionals have had on him both personally and professionally. He connects with audiences, inviting their attention by providing new context and meaning to the healing arts. Through expressing his awareness and deep gratitude for the benefits of the unique mission of Nursing, Moore has helped many other alternative healers in our world to heal. His poetry informally serves as a form of meditative medicine that reflects personal healing and also addresses many public themes we share together in concern for our world. Moore addresses unanticipated themes of healthy gender in respect to balancing humanity’s need for a deeper collective healing; especially of men and women in relationship to each other, and the influence this has upon our lives. While Richard’s writings and speaking presentations are essentially from a professional perspective, they also draw heavily upon many unfortunate personal circumstances and past experiences from a client’s and patients perspective. Garnered from conditions and events ranging from tragic accidents, sudden family deaths, a mother’s widowhood, illnesses ranging from heart attacks, to brain tumors, and female cancers, Moore’s works endeavors to express the depth of transformational healing and love that is inherently contained within nursing and other holistic practices. Moores’s hallmark is his down-to-earth, interactive style that naturally engages an audience in sharing back their own wisdom and healing care with each other. The outcome has already been a life changing lesson to encourage, uplift and honor nurses / healers, and in a special context to honor womanhood (not intended in any way to diminish the important recognition and appreciation of our male practitioners). It is his intention to provide a fresh perspective that acknowledges a long overdue appreciation and deeper understanding for the role and positive contributions these healing beings contribute to us individually and throughout our world. 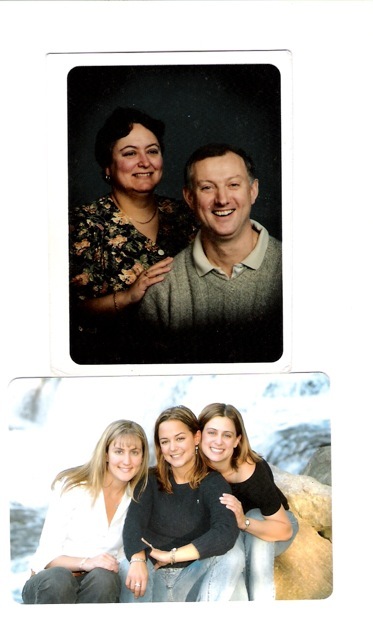 Ann and Richard Moore, with daughters Jen, Katie, and Mary below. In September of 2008, with his three daughters “leaving the nest”, Moore decided to leave his successful career in philanthropic development to follow an unknown path and clarify his intuitive desire to write. He is also performing some fund raising consulting (For “PACE” fundraising) on a limited basis, while primarily devoting his energies to promoting his book and personally speaking to groups (Nurses, Holistic healers and Gold Star Mothers of America) on his healing writings and poetry. Mr. Moore resides in upstate New York in the greater Buffalo area with Ann, his loving partner of 35 years. He is the father of three grown daughters, and has recently celebrated the birth of his fifth grandchild (all granddaughters of course) as he continues to grow with this lifelong blessing of a divine feminine theme, which also includes his three sisters! 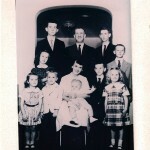 Richard Moore’s parents, eight siblings; with Richard Moore being in the middle row on extreme right. 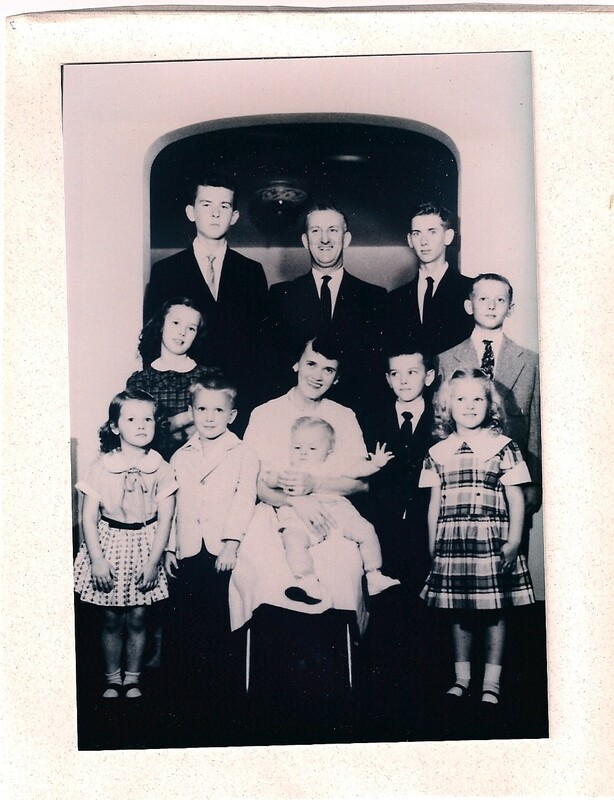 Moore’s late mother Norma, the 1920’s daughter of an immigrant, and herself a widow with nine children at a young age, was never able to realize her desire to become a nurse. His observations of how his Mom was challenged by age old cultural conditions so harmful to woman (and men) for so long, have clearly impacted and influenced his poetry in themes of gender, healthy balance, forgiveness, healing, and Love. Two of Richard’s three sisters are career nurses, with the third also being a healer in her own right. 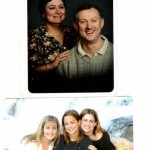 One of his daughters is also a nurse in Grand Rapids, Michigan.